We would like to bring together our entire ICS community (since 2002!) to celebrate the school’s recent charter renewal. 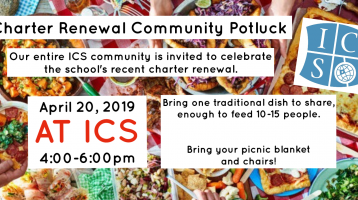 This is a very exciting time for ICS, so join us for great company, food, and celebration. Where: Location changed- it will be at ICS!!!! What to bring: Please bring one traditional dish to share, that can feed 10-15 people. Also, bring your picnic chairs and blankets. It is with great joy that we share that the state of Georgia has approved our petition and renewed our charter for another five years (2019-2025)! Our school has the opportunity to continue pursuing our mission to educate children from refugee, immigrant and local backgrounds with a rigorous and holistic education in an intentionally diverse community of learners! As a public charter school, we must submit a charter renewal petition every five years, first to our authorizer, DeKalb County, and then to the state of Georgia’s department of education for approval. As a public charter school, both the county and the state are trusting us and giving us the flexibility to educate our students well and manage our organization effectively using taxpayer’s dollars. The charter renewal process holds us accountable. After more than a year of work, our petition was first approved by the DeKalb County Board of Education and has now been approved by the Georgia State Board of Education. Thank you to each of you for making this happen. The charter petition includes hundreds of pages of documents; it’s a story of the past five years of hard work (and the story of the years that came before) and the vision and promises for the coming five years. This is your story—you are the teachers who did the home visits, the families who welcomed teachers into your homes, the children who grinned as their teacher sat on their couch. You are the devoted volunteers of the School Within a School program whose work with students fascinated and encouraged our charter renewal committees. You are the team that keeps our finances solid, builds relationships with community members to raise funds, prepares nutritious meals for our children, and ensures that our building is safe and our systems running smoothly. You are the educators who work hour after hour, day after day, to help children grow as language users (in many languages), readers, writers, mathematicians, scientists, and global citizens and leaders who embody the IB learner profiles. You are the leaders who coach teachers, move strategic plans forward, and dream and plan for the future. You are the families who believe in our school and trust us with your children. You are the founders who had the courage to dream of and open the International Community School in the first place. You are the children who make all this work worth it! You come from a variety of backgrounds and share your differences in ways that make the whole community stronger. Having this approval is a mandate to move forward and keep making improvements so that we can serve our children better every day. Let us continue this important mission with passion and purpose. It is so important that we are on the same team, that we speak highly of each other, and that we assume the best in one another. The governing board, the school leader, the staff, and the families are here for the same purpose, and we must believe in, trust, and encourage one another. Our students deserve a united team working together for their good. Look out for upcoming invitations to celebrate our charter renewal together! We are looking forward to lots of student learning and community building in the next five years. We will be sharing more about the details of the charter soon and the vision and goals it sets forth for the next five years.